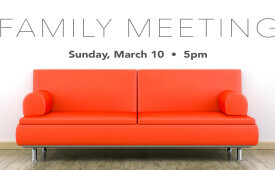 The recording of the GENESIS Family Meeting held on March, 10, 2019. GENESIS is a BIG space... over 15,000 s.f. It takes MANY hands to keep the space clean, organized, and in good shape. If you'd like to begin serving on the Facilities TEAM, please contact our Associate Pastor, Kyle Asmus.